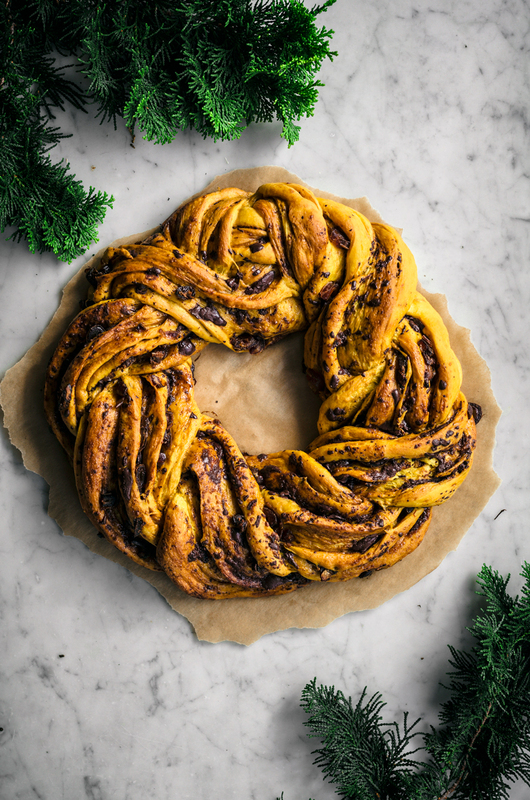 This is a spelt based, vegan version of a festive classic, the saffron wreath. 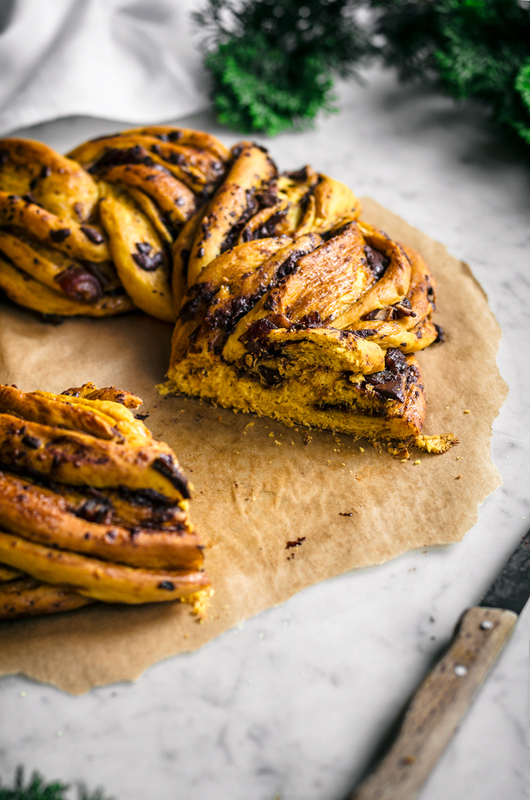 Saffron adds a beautiful golden colour and rich flavour to this bread, which is filled with dark chocolate, dates, and coconut sugar. 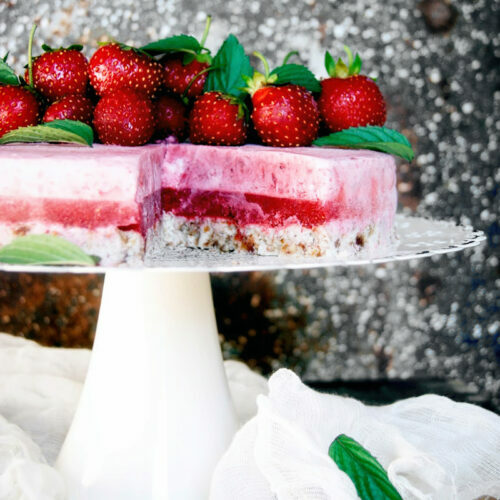 Just sweet enough for dessert, and perfect for the holidays. I know saffron is outrageously expensive, and it’s certainly not something you use every day. It’s something very special for the holidays, though, and a very worthwhile splurge to get a gram or two to make a festive saffron wreath. I have never shared a recipe using saffron before, but it’s absolutely in my top five spices – even though it’s certainly not a pantry staple. Make sure if you buy saffron that it’s in a dark package or container. Prolonged exposure to light is the worst thing for it, and it will lose colour and flavour as a result. So those cute little glass containers with saffron? Not the best. I particularly like this one, which comes in a tin, and it’s relatively inexpensive for good quality. And it’s more expensive than gold, gram for gram, so you should be getting your money’s worth! My mom always has a bit of saffron in the house and we used to bake a saffron wreath, braided bread, or buns around Christmas every year. 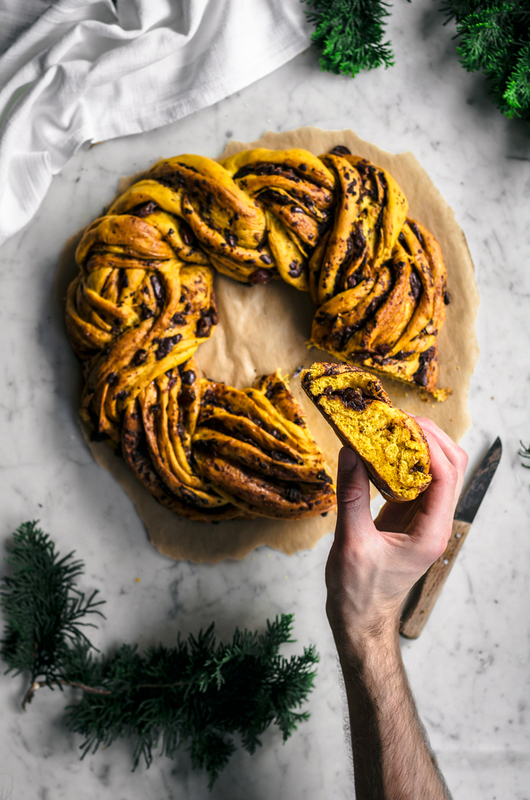 It’s very common in Northern Europe and Scandinavia, but you might be most familiar with Lussekatter, or the pretty yellow buns made in Sweden for St. Lucia’s Day, a solstice celebration. They’re made throughout the holiday period but more traditionally on December 13th. We don’t have those particular buns around here, but I did grow up baking sweet breads like this one with my mom and sister. Our saffron breads during my childhood were heavy on butter and dairy milk, and I don’t remember them ever including chocolate or dates, but it’s the same idea. 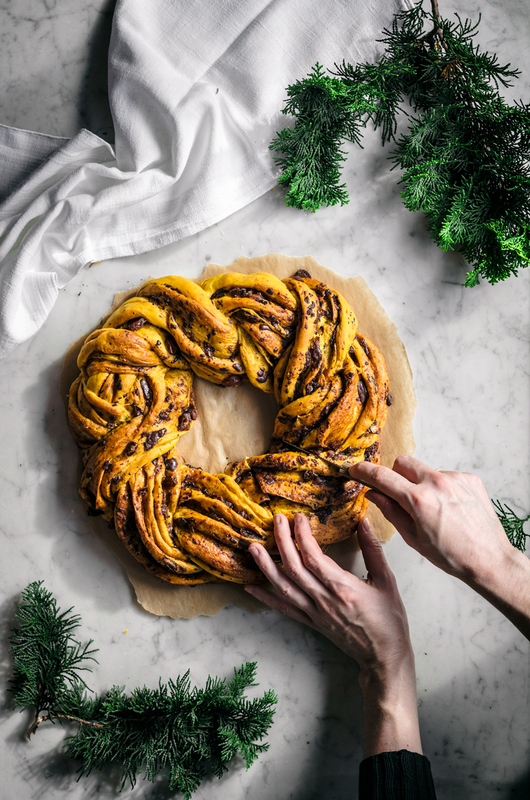 It’s just a vegan saffron wreath instead. 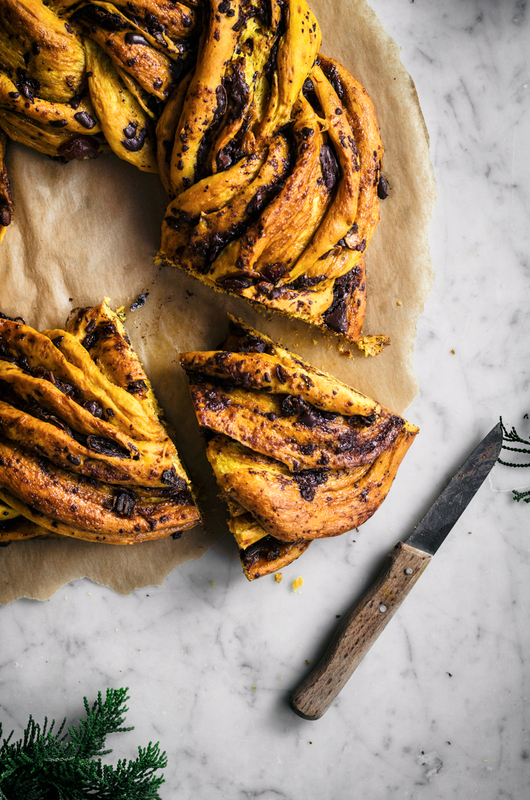 The dark chocolate in combination with the rich saffron dough is spectacular, as is the sweetness and caramel notes of the dates and coconut sugar. By the way! We have now, barring that one final appointment goes well, found a house. We’ll be moving in the middle of the month so I hope I’ll be able to make a saffron bread one more time before Christmas in the midst of all the packing and unpacking. That being said, I just remembered the house doesn’t have an oven yet, so probably not! 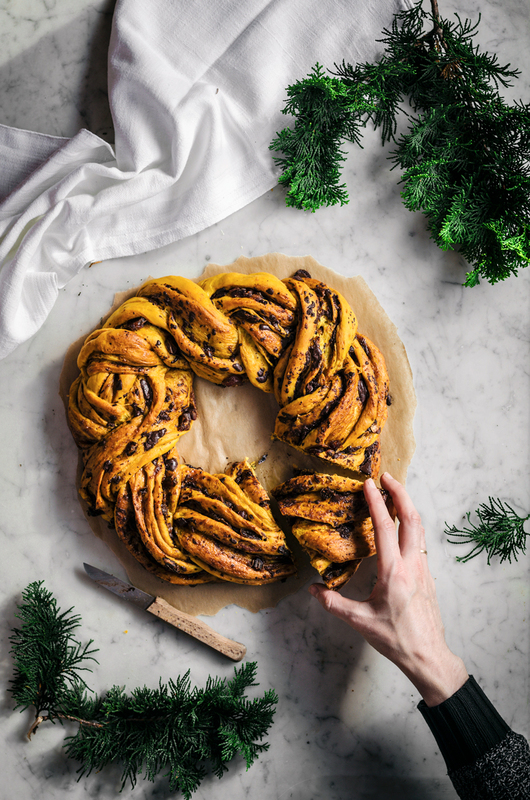 To create the saffron wreath, you roll the dough lengthwise like cinnamon buns, then cut down the middle lengthwise to create two pieces of dough with layers. Leave an “anchor” at the top, about 5cm where you don’t cut it. Then you twist the two strands around one another from top to bottom, keeping the cut side facing up, and then form it into the wreath. A trick to make sure the wreath has a nice looking join is to take the two strands of dough, separate them from the coil, and wrap them around the other end of the wreath where you want to make the join. I usually cut the anchor after my two-strand braid is completed and use that to create the join. So instead of trying to squash the ends together, you’re wrapping it instead and sealing underneath. I hope that makes sense. If you look at the top left corner of the wreath in the above picture (before baking) maybe you can see what I mean. Coming up from the bottom, you can see where the strands separate and go around and then under, particularly on the left side on the outside of the wreath. If you have any questions please email me or leave a comment below. Graham suggested that I make a video but that’s not going to happen this year! 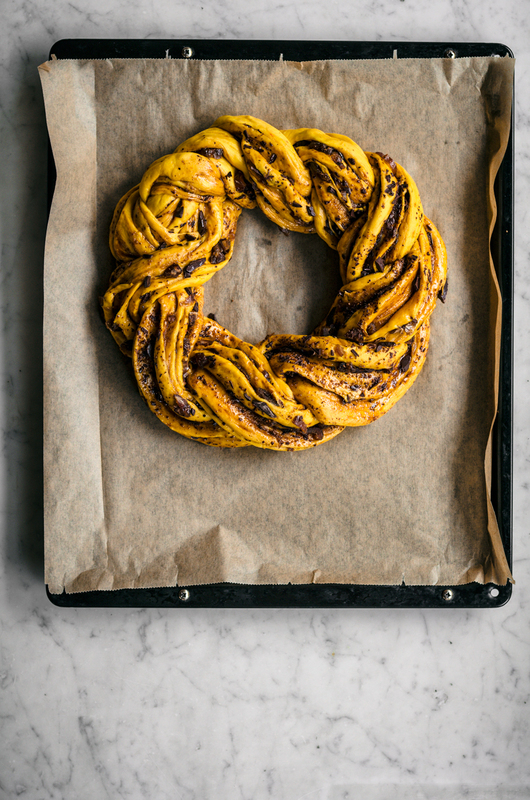 I used a different method for my chocolate orange wreath bread from last year and you know what? It was such a horrible join that I didn’t photograph the whole wreath. This way is so much better. PS that’s Graham’s hairy arm, not mine. I am at least slightly less hairy. The base dough is quite simple, similar to my basic vegan cinnamon buns and the enriched dough I generally make without a recipe. Just nondairy milk, a little oil, a unrefined sweetener, salt, yeast, and flour. In this case we’re also adding a few saffron strands to the milk while it heats, which will turn it a beautiful bright yellow colour. The filling is just a bit of chopped dark chocolate, dates (or raisins, if you’re a cretin), a little coconut oil, and coconut sugar. You could just as easily substitute honey for the coconut sugar but I love the flavour in this recipe. And because someone always asks, you can use all-purpose flour in place of spelt. If anything, it will rise more effectively and be easier to work with. The amount of flour you use will change very slightly but it shouldn’t make enough of a difference to notice, really, you just might add a little more or less while kneading. I’m providing instructions to knead by hand, but you can also use a stand mixer. Just follow the same directions but mixing with your kneading attachment adding the flour a bit at a time until a soft dough forms. 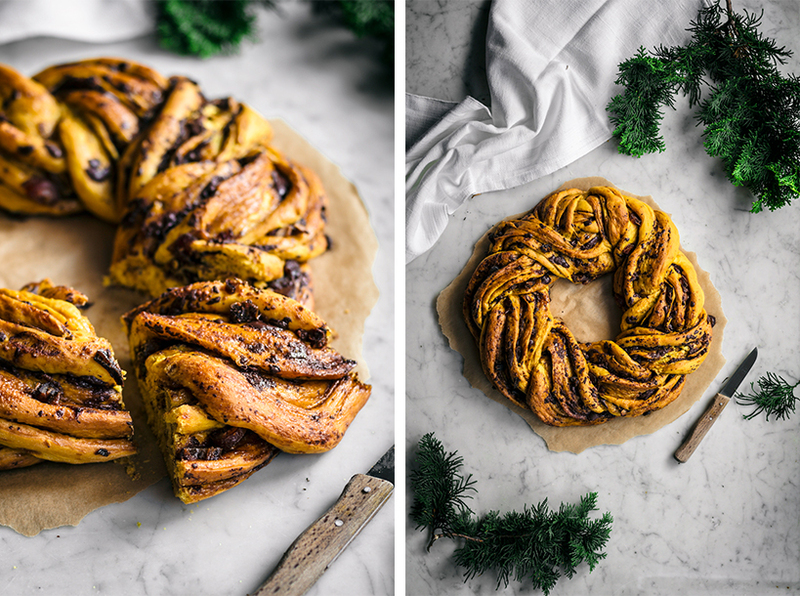 If you want to make this bread but a wreath scares you, then just cut the roll into rounds and bake it like cinnamon buns. It’ll taste the same, but won’t be quite as festive. 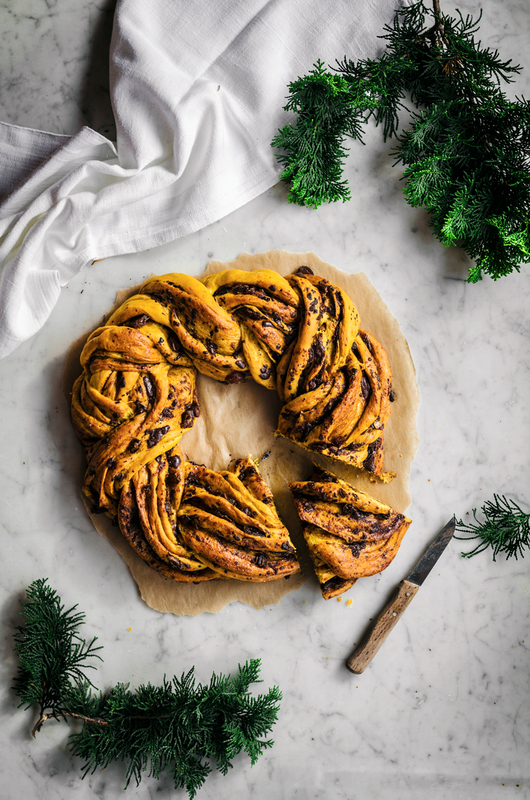 But seriously, how pretty is this saffron wreath bread? Add the milk to a small saucepan with the saffron threads and heat over low-medium until just simmering. Whisk in the coconut oil and coconut sugar, then pour into a large heatproof bowl. Let the milk mixture cool until just warm to the touch, then whisk in the yeast. Leave it for 15 minutes, or until foaming. Stir in 1 cup of flour along with the salt. Add the remaining flour in 1/2 cup increments, stirring between each addition, until it becomes too difficult to mix with a wooden spoon. Turn the dough out onto a well floured surface and knead, adding more flour as necessary, until a soft, smooth dough forms, around 8-10 minutes. Oil a large bowl and place the dough into it, turning it a couple of times to coat it in a little oil. Place a large plate over the bowl and set it into a warm place to rise until doubled in size, about an hour. Line a large baking sheet with parchment paper. Turn the risen dough out onto a lightly floured surface and roll into a large rectangle, about 2cm thickness. 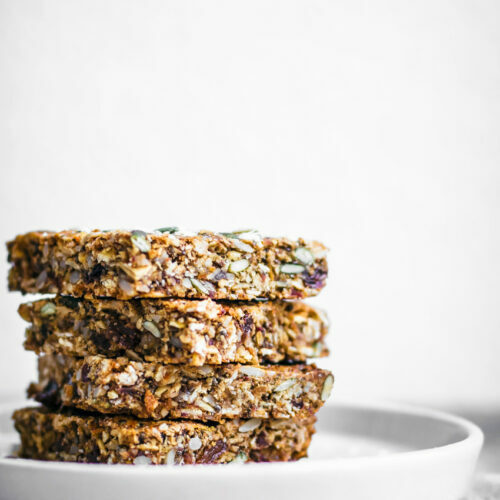 Spread with the coconut oil, then top with the coconut sugar, chocolate, and dates in an even layer. Roll the dough up lengthwise, the cut lengthwise down the centre into two long strips. Leave the top 5cm of dough uncut to create an anchor. With the cut side facing up, twist the two pieces around one another, lifting one and placing it over the other from top to bottom. Give yourself plenty of space for this. Once your coil is finished, form the wreath. Bring the ends around to each other, then cut your anchor and wrap the two pieces around the other end of the coil and tuck underneath, pressing lightly to stick. Gently lift your completed wreath onto the prepared baking sheet and cover with a clean tea towel. Adjust to make sure you have the desired shape (now, before it proofs a second time). Place in a warm spot to rise again for 30 minutes. While the dough is proofing, preheat the oven to 180C / 350F. Once it's finished rising, bake the wreath for about 30 minutes, or until lightly golden. Cool on the baking sheet for another 20 minutes before cooling fully on a rack. Best eaten fresh, but leftovers will keep in a well sealed container on the counter for up to three days. 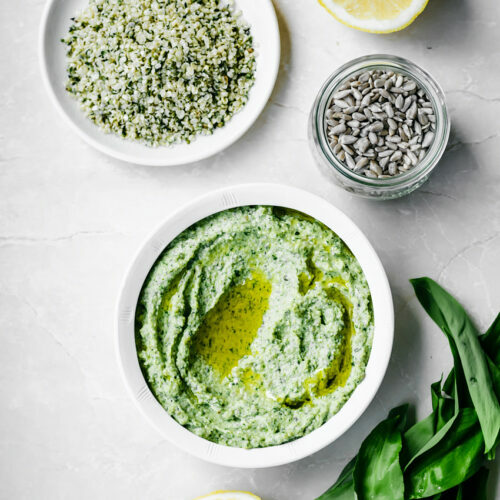 • I highly recommend either buying fresh yeast for this recipe or testing your yeast beforehand! You don't want to waste that precious saffron on dead yeast. • The dough will want to fall open a bit when you cut it, especially if your dates are cut a little big. Don't worry if some of the filling falls out, you can just add it back into the dough before it rises the second time. 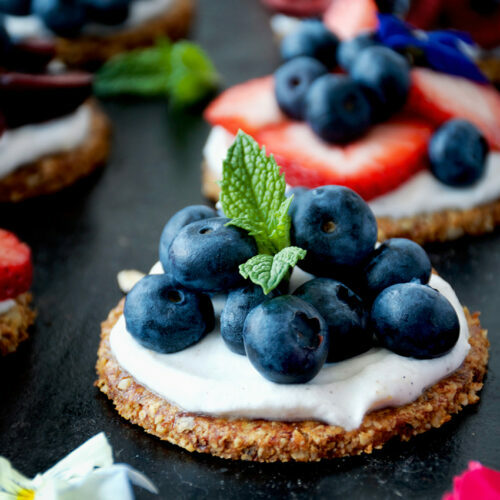 * A lighter milk will result in a better texture, as opposed to full-fat coconut milk from a can, for example. My preference is always oat milk.